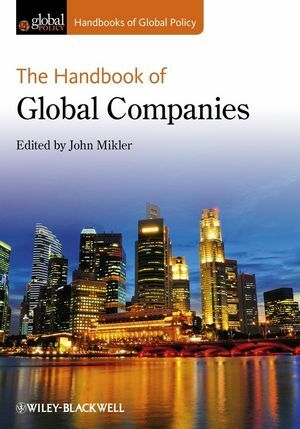 The Handbook of Global Companies brings together original research addressing the latest theories and empirical analysis surrounding the role of global companies in local, national, and international governance. Considers the environmental and societal responsibilities of global corporations. John Mikler is a Senior Lecturer in the Department of Government and International Relations at the University of Sydney. His research interests are primarily focused on the role of transnational economic actors, particularly multinational corporations, and the interaction between them and states, international organizations and civil society. He is the author of Greening the Car Industry: Varieties of Capitalism and Climate Change (2009), and has published widely in journals including Business and Politics, Regulation and Governance, Global Society, Policy and Society, Cambridge Journal of Regions, Economy and Society, and New Political Economy.